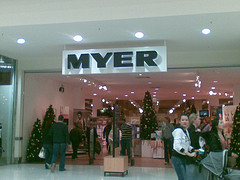 Myer boss Bernie Brookes and his counterpart at David Jones, Paul Zahra, believe they will both get to 10% of total sales done online over the next three to five years. Australian retailers are crawling to 10% online penetration slowly, while their retail peers in the US and Britain have already met and surpassed that benchmark and are well on their way to 20% of all sales done online. Analysts agree that Australian retailers have been slow to get online, and that hesitation and lack of investment going back to last decade have meant we will probably remain behind the pace of the US and western Europe. ”The Australian department stores in particular and retailers in general have copped a lot of flack for being slow to move online,” said Caroline Finch, senior analyst at research group IBISWorld. Brookes says the current trajectory of online sales in Australia is similar to what was experienced in the US and Britain, which augurs well for stores such as Myer matching the online sales rates booked by the likes of Neiman Marcus and John Lewis. ”If you look at the growth of online for John Lewis, Debenhams, Macys, Nordstrom and Neiman Marcus and you plot it – it’s almost identical to us. The key game-changer, experts agree, is the proliferation of hand-held mobile devices, such as iPhones and tablets, that liberate shoppers to be able to make on-the-spot purchases as they walk through a department store, ride on a train or like what they see in a magazine as they sip a coffee at their favourite cafe. ”And this is what we see in the banking sector,” said NAB retail sector head Tiernan White, ”where mobile connectivity is extremely important to us. To see more on this story, click here. This entry was posted on Friday, March 28th, 2014 at 9:57 am	and is filed under Australia, business, E-mail & the internet, internet usage, online business, Online Sales, online shopping, online stores, selling online. You can follow any responses to this entry through the RSS 2.0 feed. Responses are currently closed, but you can trackback from your own site.